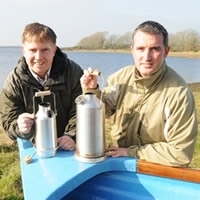 Brothers Seamus & Patrick Kelly (company Directors), are proud to be the fourth generation of 'Kelly's' to bring you their popular kettles and camping equipment. Following in the footsteps of their father Padraic, grandfather Jim & great-grandfather Patrick, the Kelly brothers continue to develop the 'Kelly Kettle' Brand and bring you their loyal customers, new and exciting products & gear. The first kettle dates back to the 1890's to a small farm on the shores of Lough Conn, County Mayo, Ireland, when a young Patrick Kelly (Great grand-father of the current Co. Directors), a small farmer and fisherman, developed his first kettle from Tin after a cold winter of tinkering and experimenting in a shed. The kettle worked extremely well but burned out from regular use on Lough Conn when Patrick was fishing for Trout & Salmon the following summer. After going through a number of Tin kettles, he developed the kettle in copper and this was found to be much more durable. News of his kettle spread among local anglers and it received wonderous looks from anglers visiting from the U.K.
Patricks son, Jim (Grandfather of the current Directors of the company) became a famous angler & boatman/ghillie on Lough Conn. Renowned for his speed at boiling water in the kettle, Jim always had a kettle with him when fishing. The Kelly Kettle was now becoming popular with fishermen in the west of Ireland where the speedy kettle produced boiling water for hot drinks on wet & windy days. At this time, the business was still only a 'hobby' during the winter and there was only one size kettle (what would now be the 1.6 ltr 'Base Camp' Aluminum Kettle) available and these were only ever made to order. 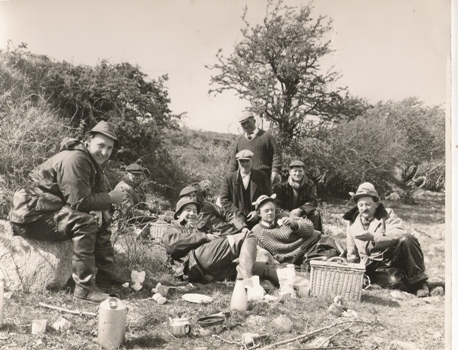 Pictured above, the late Jim Kelly (grandfather of Patrick and Seamus, seated center back) enjoys lunch on Lough Conn with a party of Welsh angler in 1964. Faster & cheaper transport brought ever increasing visitor numbers to Ireland throughout the 1970's & 1980's. As a result, more and more visiting anglers, primarily from the U.K. & Germany, were exposed to the Kelly Kettle for the first time. 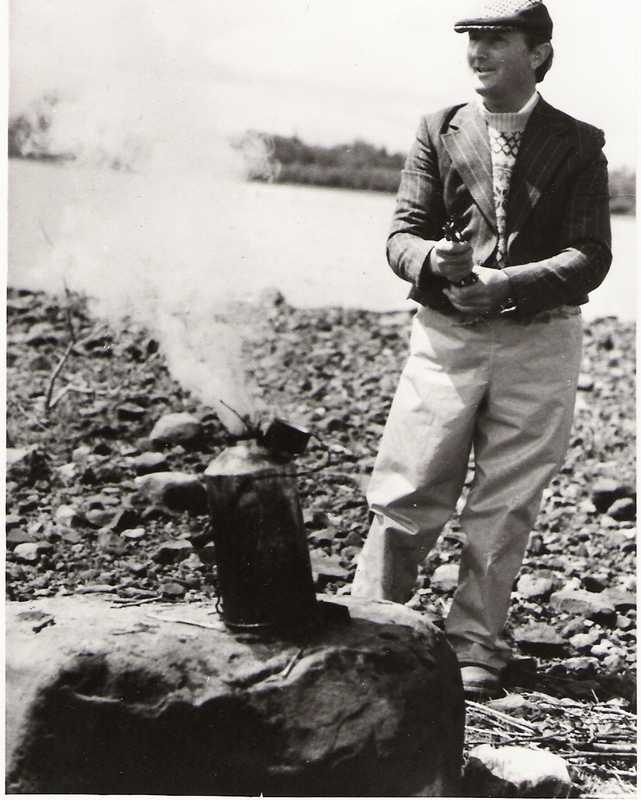 With increasing numbers of visiting anglers requesting the kettle to be added to their camping gear, it became apparent that something needed to be done with regard increasing the production of the kettle. In the 1970's Padraic Kelly (father of the current directors) implemented modern manufacturing techniques but the business was still very much a 'Cottage' type business. Over time a second size Aluminum kettle was produced (the small 'Trekker' model) and aluminum cook sets were added. It was still a very small family business, but with Padraics reputation as a ghillie and angler on Lough Conn and his regular appearance as a member of the Irish Trout Fly-Fishing team, word of the kettle as started to spread. Later, with the advent of the Internet, news of the Kelly Kettle would spread intenationally around the globe to the U.S., Canada, S.Africa, Japan, Australia, etc. Patrick & Seamus took over the helm of the Kelly Kettle Company in 2005 and brought their respective Commercial Banking & International Marketing experiences to bear on the business. We quickly developed the Pot-Support & Medium 'Scout' Kettle - both in aluminium. As a very small family business, we felt it was vital to obtain feedback from our customers to see what products they really wanted! It quickly became apparent that demand internationally for aluminium product was dropping fast! Aluminium cookware really was going out of fashion at an alarming rate. Instead, we saw an increasing demand for Stainless Steel items, particularly in countries like the U.K., Germany, Japan, U.S.A. and Canada. Now with neither the tradition, expertise, nor tooling (no funds to buy the tooling either!) to make steel kettles, we were faced with tough decisions. Either watch as demand for aluminium products continued to drop, or 'bite the bullet', remortgage our homes and invest heavily in the business and try and produce steel kettles. Thankfully, we went with the second option. After significant investment, lots of searching and trial & error, we were finally able to produce our first Stainless Steel 'Base Camp' Kettle which proved hugely popular and in truth, probably saved the 'Kelly Kettle' business from extinction. Stainless Steel Cook Sets and a steel version of our pot-support followed soon after as we moved away from Aluminium accessories. All three sizes of our kettles are now available in Stainless Steel as well as Aluminium. In summer 2014 we launched a stainless steel Hobo Stove accessory to allow easy cooking over the fire bases of our kettles. Also launched was a high quality stainless steel Camping Cup set with popular features. Recently we have added a steel Camping Plate set, a new 'Ultimate-Kit Value Deal offer and a Whistle for our Camping Kettles which sounds off when the water boils. We have numerous other products (all camping quipment) in the development stage and look forward to bringing you some of these during 2019. The tradition of using the kettle as a method of boiling water at lunchtime, goes back to the 1890's in the West Coast of Ireland and the design has changed little since it was first introduced. Lough Conn was, and still is, famous for its free rising brown trout and fresh run Salmon from the River Moy system. The lake provided (and still provides) ample fuel for use in the kettle, where washed up twigs, sticks and dried grass were easily available. On wet & stormy days, the local angling guides would keep watch for the small pillar of smoke on the lake shore which indicated that a fellow ghillie already had a 'brew' on! A hot cup of tea or soup awaited anyone who landed and the Kettle would be repeatedly boiled as additional boats laden with anglers arrived. Tradition dictates that both the angling guide and his guests (usually 2 anglers to his boat) together would gather dry tinder for the kettle from the lake shore. Then, the guide will set about boiling up the kettle which always amazed guests as it works even in the height of a storm! The Anglers will then be offered their fresh tea from the Kelly Kettle and in return for his hospitality, the boatman/guide received lunch and perhaps a drop of whiskey from the anglers! Increasingly gaining in popularity, our company now sells our Kettles all over the world from the USA, Canada, UK, Scandinavia, the Netherlands, Germany, Russia and as far away as Japan, Zambia, South Korea & Australia. Once exclusively used by anglers, Kelly Kettles are now seen as essential camping equipment and are been used by all types of outdoor enthusiasts such as explorers, Kayakers, hill walkers, Car Campers, Scouts, Hunters, Gardeners or as a vital item in Emergency Preparedness & Wilderness Survival Kits.